Learn a pendant design for yesterday, today, and tomorrow! 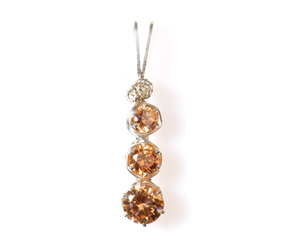 This meaningful pendant design will incorporate three different stones which can represent anything: the passage of time, three members of a family, or even favorite or matching colors. Weave these cubic zirconia stones together in this beautiful design, and you’ll gain knowledge which will serve you for years to come. When you tell a customer you can make her this pendant (and even a pair of earrings to match!) in any colors she chooses, she’ll be completely attached to this simple design: dressy enough for elegant occasions, but easy to dress down, too. And did we mention this uses snapsets? Dale “Cougar” Armstrong gives guidelines and tips for working with snapsets, perfect for any wire artist perplexed by these findings. Using snapsets will be a cinch when you use Dale’s technique! This is probably my favorite one and will be making more! The snapset I received had the prong setting already on it, so was wondering how to finish the top of this when you have a prong there. I choose to trim it away and make my own. Love all of these and will continue on through the rest of all of your DVDs that I have. I am so excited!! Out of all 6 lessons, I did lesson 6 – I figured if I could accomplish this one I could do the bracelet and the cameo pendant and leaf link easily…..Just finished the bracelet I’m on to better things.. With your great instructions and my 21 gauge wire I’m ready for more challenges!!! I had to use 21 gauge HH SS in square, half round and round it was a little more stiffer than 22 would have been but it worked! Thank you again!! That’s wonderful news Chris! 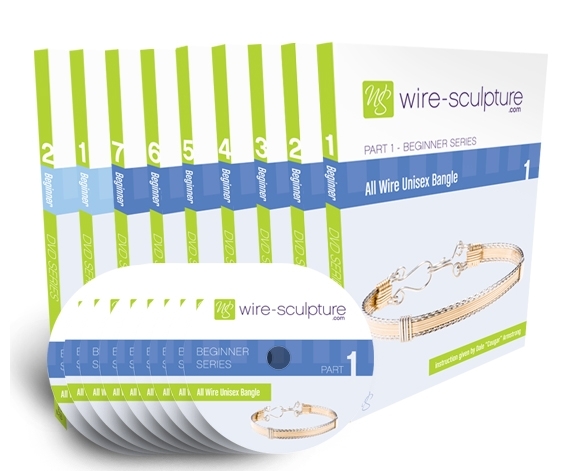 You are right – if you can make a pattern come out nice by altering the wire gauge you are off and running! Congratulations : ) I am looking forward to hearing about your next project. I went home and I had the 20 guage half round hh and by using my notes I was able to finish the pendant and I think I looks pretty good. I am doing this series at my college library and I have had some pretty good comments from the others around me. The only thing I can’t do Is the work hardening with the hammer. I have to be quiet. Too cool Marilyn – being able to actually work with me in a library! I really enjoyed this lesson but I was disappointed that the kit had 22 guage round hh ss instead of the 20 ga hr hh ss that was used in the lesson. I took lots of notes and will go home and see if I can finish this on my own. I passed your challenge along to ‘the powers that be’ as I am sure they will make it right.